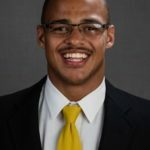 Iowa tight ends Noah Fant and T.J. Hockenson and Iowa State sophomore tight end Chase Allen have been named to the 2018 John Mackey Award Preseason Watch List. Fant is a junior and Hockenson a sophomore. Presented annually by the Friends of John Mackey, the award goes to the nation’s most outstanding tight end. Iowa is one of only three teams to have two student-athletes named to the 64-man list. In 2002, Dallas Clark won the award, while Tony Moeaki (2009) and Allen Reisner (2010) were the most recent semifinalists for the Hawkeyes. Fant (6-foot-5, 241-pounds) and Hockenson (6-foot-5, 250-pounds) were a two-headed monster for Iowa last season. A third team All-Big Ten selection, Fant recorded a career-high 30 receptions for 494 yards, and an Iowa single-season record and an FBS-leading 11 touchdowns by a tight end. Fant averaged 16.5 yards per catch, which led the nation amongst tight ends. Earlier this summer, the Omaha, Nebraska, native was named to the Athlon Sports All-Big Ten and first team All-American team and a Sporting News first team preseason All-American selection. Hockenson caught 24 passes for 320 yards and three touchdowns last season. A native of Chariton, Iowa, Hockenson had five receptions for 71 yards and two touchdowns — all career highs — in Iowa’s 55-24 win over third-ranked Ohio State. Hockenson was a Big Ten All-Freshman honorable mention selection by BTN.com. A native of Nixa, Mo., Allen started nine games at tight end while for the Cyclones earning Second-Team All-Big 12 honors in 2017.